This year on my recent trip to northwest Cameroon,I visited a remote village with a small primary school of 200 students. There was no clean water and barely dirty streams around. 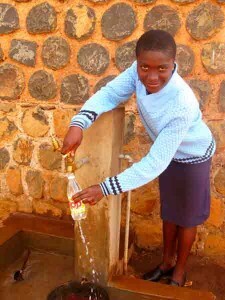 With permission from the neighboring village and Shared World Visions donations, we connected to their water source and built 2 taps at school,and one on the road for the village. Baichu water project Northwest Cameroon March 2015 from lois pierris on Vimeo. The government high school,population 1800,had a large number of students who were failing their classes. I suggested that we sit down with them to find out what was interfering with their studies. After interviewing 60 students, we found that many of them came to school hungry, and didn’t eat until they went home. We began serving hot (powdered) milk and bread to students in mid March. The cost per month is $50 .. this is the second year of the breakfast program. if we can raise more funds we can serve a small breakfast.. MILK update from lois pierris on Vimeo. outdoor market in town. The private water company will only supply the water,they will not expand the lines or build taps. By the middle of April the market had clean drinking water during the long hot days. 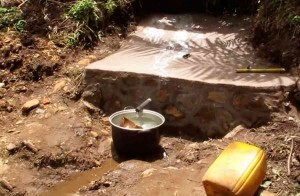 Water taps in Fundong in northwest Cameroon from lois pierris on Vimeo. Shared World Visions raises the funds and sponsors children in primary and secondary schools in Fundong and Meli,Cameroon, collaborating with Better Family Foundation,a local non-profit. Each semester we meet with the students, their family or caregiver, discuss their grade average and problems they are facing. If there are sufficient funds,we assist with books and uniforms as well. Shared World Visions funds the Student Sponsor Program at Government Bi-Lingual high school in Fundong Cameroon from lois pierris on Vimeo. Bainjong village had one water tap and a stream at least 1 km from the closest compound. We planned a water system that would provide a clean water tap in each of the seven compounds which are several kilometers apart. We built a tank that will hold 7000 cubic liters of water. (1,848,000 gallons) and utilized the exisiting tank as well. We are planning to connect several other small villages to the large tank we built. With donations from friends and family to Shared World Visions, we completed the project with $7200. Using donations totaling $2400 that I received from friends and family, we were able to tap into the Ngwainkuma water system, adding 5 additional taps to bring water to Meli high school and the village health center,making clean water available to over 600 people. The high school students carried stones to build the catchment and dug all the ditches for the pipeline. 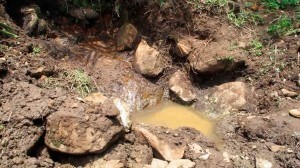 The construction of the water project for Ngwainkuma was begun in September 2010 and completed in January 2011 with OFI raising $15,000 and the village contributing $10,000 in labor. Under the supervision of BFF, a local nonprofit, the village now has 27 working taps every 200 meters (650 ft ), supplying over 3500 people with water from a mountain stream. This is the last African project OFI is undertaking, concentrating their efforts in Haiti. In February 2009 I spent six weeks in the village of Fundong, working with a local NGO, identifying needy families who received fruit tree seedlings that would eventually provide a source of food and income. I visited schools and outlying villages, speaking to groups of women and lecturing students in the classrooms. One important issue was illnesses caused by dirty water, and I urged everyone to boil water before drinking. While visiting the government high school ,I was shocked to hear there were no working water taps at the school and the central government refused to pay for a connection to their well 3km away. The principal Patrick Muluh asked if I could raise $8000 and the school would donate the balance in labor and supervision. Back in the States in the summer of 2009 I contacted my friend Bill Winkley who with friends and family had a small NGO,One Family International, that funded water projects all over the world. Through the magic of the internet, Bill and Patrick were able to agree on terms. The water system began flowing in January 2010, benefiting 1700 students and teachers. After the success of this project I was approached by several villages asking for my help raising funds to access clean water. I videotaped my interviews with village elders while they explained the water situation and various solutions. Each township provided me with proposals, costs and diagrams for its water project. Editing my footage for One Family International to view, I chose the proposal from the village of Ngwainkuma as the next project.